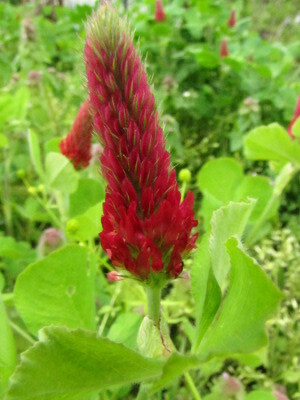 Crimson clover is one of the cover crops we put in last fall that didn't winter kill. I've been laboriously ripping the clover out --- a difficult task since crimson clover doesn't really start growing much until the spring, so lots of weeds colonized the bare soil over the fall and winter. Now that the clover is big and strong, its roots are also quite tenacious. Let me just tell you that weeding three beds of overwintered crimson clover took as long as weeding ten or fifteen beds that had been home to fall oats. Despite the pain and agony of dealing with my mistake, I decided to leave one clover bed alone to see what happens. A few days ago, pyramidal red blooms opened up, and Tuesday I noticed that the bed was loudly buzzing from the bees who had come to call. Maybe this cover crop has merit after all, I pondered, leaning in close with the camera. 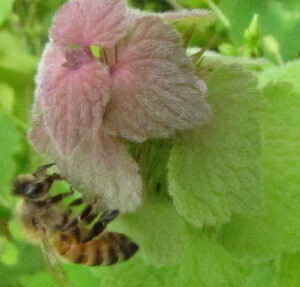 That's when I noticed that every single one of the honeybees present was feeding on purple dead nettle --- Mark had just mowed down our weedy "lawn" and the bees had found the only weeds left in bloom. To be fair, though, I should mention that our native miner bees seemed to be concentrating their efforts on the crimson clover. Although you would think I'd be telling you that crimson clover is off my cover crop list for good, I'm actually pondering whether a mixed planting of crimson clover and oats in the fall might not be a good combination. The oats would prevent weeds from colonizing the ground, then would die back into a high carbon mulch over the winter. 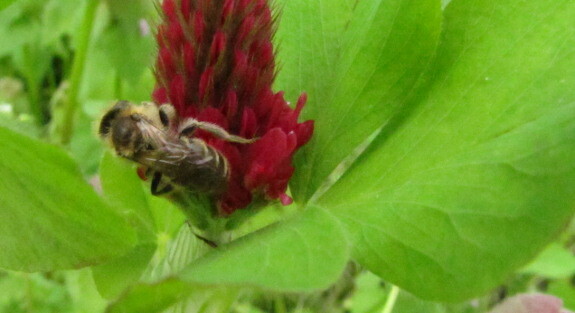 Come spring, the crimson clover would poke through and put in some serious growth to add nitrogen to the soil. I've read that crimson clover will reliably mow kill as long as you wait until it's in full bloom --- I was only hand-weeding because I thought the clover wouldn't bloom in time to let me kill it and still plant my summer garden. Definitely worth a try for next year! Our chicken waterer is perfect for broilers on pasture. I planted white clover in my garden this year and I've only pulled it out piece by piece when I need the space to plant. I still put veggie plants out one plant or a couple of seeds at a time, no big patches, so it has been manageable... but still a pain, I have to admit. I'm glad to know I'm not the only one who is regretting my clover plantings just a little bit. Next year's plan sounds like a good one. Good luck!